Twenty-nine Turkish police officers went on trial in Istanbul on Tuesday accused of involvement in the July 15 failed coup, the first trial of the alleged putschists to open in the city. The suspects, 24 of whom are under arrest, went on trial at the gigantic courthouse by Silivri prison outside Istanbul, the state-run Anadolu news agency said. The first hearings are expected to last four days and the session began with the reading out of the names of the accused as well as the indictment. This was expected to be followed by arguments for the defence. The suspects are charged with refusing to obey orders to protect President Recep Tayyip Erdogan on the night of the coup. Five months after the coup, small-scale trials of suspects have already began in the provinces but this is by far the most significant process to begin so far. ISTANBUL (AP) — Twenty-nine Turkish former police officers went on trial on Tuesday accused of aiding the failed military coup in July — the first trial in Istanbul over the attempt that led to some 270 deaths. 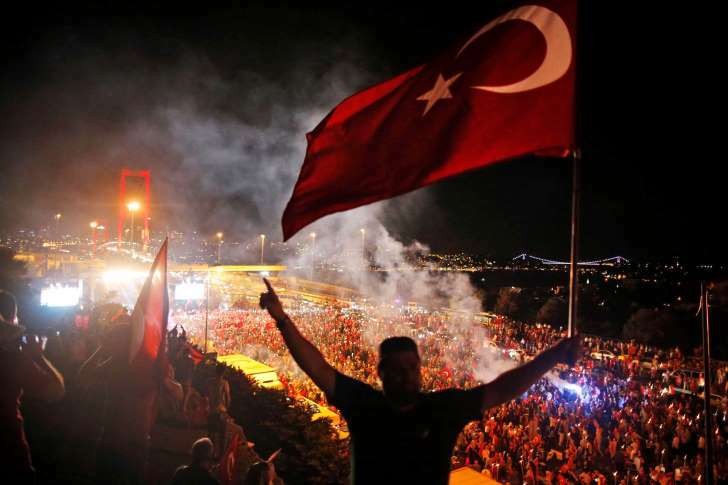 Renegade officers in Turkey's military used tanks, fighter jets and helicopters in their July 15 attempt to unseat the government, attacking the parliament and other key buildings. Turkey blamed it on a network of followers of the U.S.-based Muslim cleric Fethullah Gulen — an ally turned foe of President Recep Tayyip Erdogan. Gulen, whom Turkey wants extradited from the United States so that he may also face trial, has denied any involvement in the coup. The government declared a state of emergency following the coup and has launched a large-scale crackdown against Gulen's movement, which it has declared a terror organization. More than 40,000 people have been arrested for alleged involvement in the coup while tens of thousands of other suspected Gulen followers have been purged from government jobs. The police officers are standing trial in a prison and courthouse complex in the outskirts of Istanbul include three police helicopter pilots. They are accused of aiding the coup by not carrying out their duties, including disobeying orders to protect Erdogan's Istanbul residence on the night of the coup, according to the state-run Anadolu Agency. At the opening hearing, two pilots denied accusations that they ignored orders to fly a helicopter that would carry officers tasked with defending Erdogan's residence, Anadolu reported. The two also rejected accusations of links to Gulen's movement. "I don't have the slightest link to the (coup attempt)," the agency quoted defendant Tolga Gultekin as telling the court. "There was no flight instruction given to me." Another pilot, Ender Kucuka, was quoted as saying that he and a co-pilot were ready to fly their helicopter but that the flight mission was canceled by a superior. The court was scheduled to continue hearing defense statements later on Tuesday and on Wednesday. Prosecutors have demanded aggravated life prison terms for 21 officers charged with "attempted coup" while eight others face maximum 15 years in prison for membership in a terrorist organization. The trial is the first to take place in Istanbul in connection with the coup. Some 45 soldiers are on trial in separate cases taking place in the cities of Zonguldak, Bursa and Erzurum. © (AP Photo/Emrah Gurel, File) FILE - In this Thursday, July 21, 2016 file photo pro-government supporters protest on the road leading to Istanbul's iconic Bosporus Bridge,background left. Twenty-nine Turkish police have gone on trial in Istanbul charged with involvement in last July’s attempted coup, the city’s first trial of alleged plotters in the massive crackdown that followed the failed bid to oust president Recep Tayyip Erdoğan. With 41,000 coup suspects under arrest and the country still in a state of emergency, the trials of the accused are expected to be the most far-reaching legal process in Turkish history. Five months after the coup, small-scale trials of suspects have already begun in the provinces and on Monday 60 people went on trial in the south-western city of Denizli. However, the trial in Istanbul – taking place in a huge courthouse outside the Silivri prison – is the most significant to date and the first in the Turkish metropolis. The accused are charged with seeking to overthrow the government as well as allegedly being members of the group led by the US-based preacher Fethullah Gülen, whom the authorities accuse of leading the plot. Gülen, whom Ankara wants to see extradited from the US, vehemently denies the charges. The trial got under way with the reading out of the names of the accused and the judge, Fikret Demir, reading the indictment, the state-run Anadolu news agency said. This was expected to be followed by arguments for the defence. Initial hearings are expected to last until Friday. Amid tight security, special forces in camouflage gear stood guard outside the courthouse. Of the 29 police officers due to go on trial in Silivri on Tuesday, 24 are under arrest, one is on the run and the rest are on bail. If convicted, 21 suspects each face three life sentences and the other eight officers could be handed prison terms of between seven-and-a-half and 15 years. Those accused are alleged to have refused to protect Erdoğan’s residence in Istanbul on the night of the coup. “We will make sure the guilty – within the framework of the law – are punished and given the most heavy punishment possible,” said Orhan Cagri Bekar, a lawyer and head of the 15 July Association, which represents victims of the coup. However, there has been growing international alarm over the extent of the crackdown amid the state of emergency imposed after the coup, with critics concerned it has been used to target Erdoğan’s opponents. With the crackdown showing no sign of relenting, the interior ministry said 1,096 people suspected of links with Gülen had been detained in the past week. The coup plotters killed 248 people, according to the presidency, and Erdoğan has said there are strong public demands for retribution, even extending to reimposing the death penalty. Erdoğan said last week that the assassination of the Russian ambassador to Ankara was carried out by a Turkish policeman loyal to Gülen, a claim not yet accepted by Moscow. He said that allies of Gülen – who over decades built up strong networks of influence within Turkish institutions – still needed to be weeded out of the security services. “This dirty organisation is still within the military, still within the police,” Erdoğan said. Following the start of the Istanbul trial, several others will get under way in the coming months, including of the alleged military ringleaders in Ankara. The trial of 47 suspects accused of trying to assassinate Erdoğan at a holiday resort on the Aegean Sea is due to begin in Mugla on 20 February. The courthouse in Silivri has huge resonance for Turks after it was also used in trials against suspects in 2013 accused of a separate coup plot known as Ergenekon. In that case, which was strongly supported by Gülen, 275 police officers, journalists, lawyers and academics were indicted for allegedly conspiring to oust Erdoğan. The suspects were released and their convictions quashed earlier this year, with the authorities accusing Gülen of perverting the legal process and fabricating evidence. 0 Response to "First Istanbul trial begins of Turkey coup suspects"